The highest-scoring fourth quarter in AFC Championship Game history wasn’t enough to decide which team gets to face the Los Angeles Rams in Super Bowl LIII two weeks from Sunday in Atlanta. 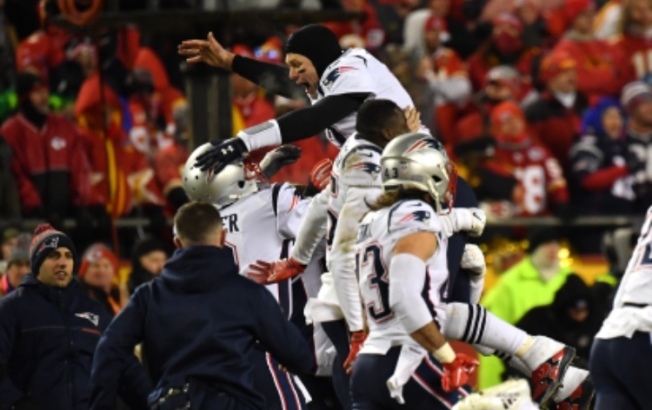 After the Patriots and Chiefs combined for 38 points over the final 15 minutes of regulation, Rex Burkhead’s 3-yard touchdown run in overtime was all it took for New England to outlast Kansas City with a 37-31 victory. Tom Brady, despite throwing two interceptions, was once again at his very best for the Patriots -- especially when it mattered most. If the drive he engineered to put New England ahead, 31-28, with 39 seconds left in regulation was vintage Brady, the drive he put together to send the Patriots to Atlanta was quintessential Brady. "You always feel comfortable with Tom," Rob Gronkowski said at his postgame press conference. The Chiefs managed to send the game to the extra session on the heels of a Harrison Butker 39-yard field goal, but their luck ran out after Matthew Slater called 'heads' for the overtime coin toss and just like in Super Bowl LI, he nailed it. Brady took the Patriots 75 yards in 13 plays, converting three third-and-10s to keep the chains moving and taking the air out of Kansas City's sails. Julian Edelman, whose drop led to Brady's second half interception, hauled in passes to grab the first two conversions before Gronkowski -- who had six catches for 79 yards, his most of each since Week 14 -- came down with the third. Brady threw for 348 yards, completing 30 of his 46 passes. His lone touchdown pass was a 29-yard strike to Phillip Dorsett in the final minute of the first half, the second touchdown connection in as many weeks between the two. Sony Michel had his second straight game with more than 100 yards rushing in the postseason, racking up 113. His 1-yard run on the first possession of the game opened up scoring, while his 10-yard run is what gave New England the lead again in the final minute of regulation. The Patriots held a 14-0 lead at halftime and 17-7 after three quarters. Patrick Mahomes, who is likely to be named NFL MVP, completed 16 of his 31 passes for 295 yards and three touchdown passes for the Chiefs. He hit Travis Kelce for a 12-yard touchdown on Kansas City's first possession of the second half and later hooked up with Damien Williams on 1 and 23-yard touchdown passes in the fourth quarter. Williams also scored on a 2-yard rushing touchdown with 2:03 left in the fourth quarter to help the Chiefs to a 28-24 lead. It was New England's first road playoff win since the 2006 divisional round, when the Patriots defeated the San Diego Chargers, 24-21. The Patriots last played the Rams in the 2016 regular season, picking up a 26-10 win at Gillette Stadium. Those Rams were coached by Jeff Fisher, however. New England's first Super Bowl victory came against the Rams, who then played in St. Louis, in a 20-17 win that was decided on Adam Vinatieri's 48-yard field goal as time expired.